Well this week really flew by. Why, I don’t know. But here it is Saturday evening and I don’t have any arts or crafts to show you. So, instead I will show you some treasures I hunted today. Mossy Cottage has been getting a little thin on inventory so I started to remedy that today. The weather was excellent for treasure hunting, but I did have to hold a hot cup of chai tea early this morning or my hands would have frozen off. There were many treasures to be had, and all the people I dealt with were treasures themselves. I love talking and joking with people I buy from! Well enough chit chat, let’s get on with the goodies! Here we have a white wicker child’s hamper. It has a cute quilted plastic lid. 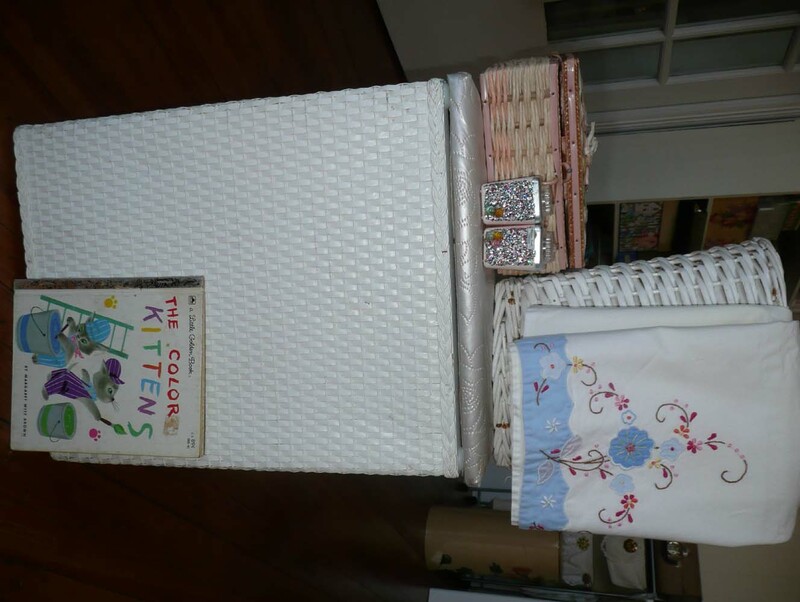 There is a white wicker trash can with an applique pillow case, a pink sewing box, some pink VA beach salt and pepper shakers and a Golden Book about kittens (go figure). 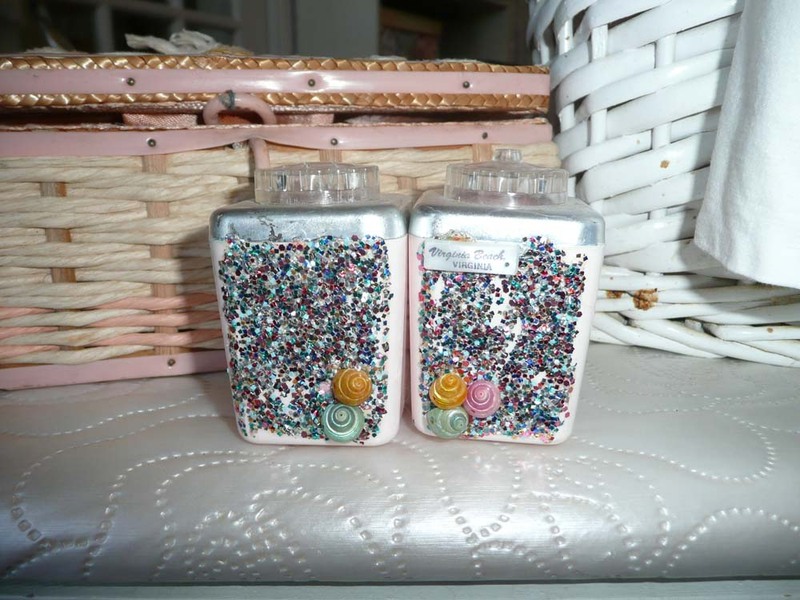 Look at these awesome shakers from the 1950’s. The picture is too bright for you to see the wonderful pink plastic under all that glitter! And the one on the right says, Virginia Beach, Virginia. 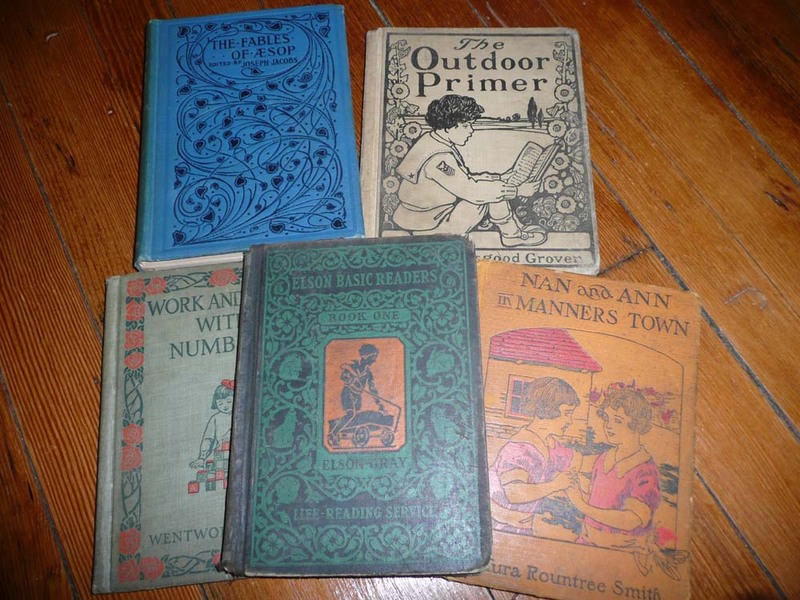 Here are some really nice old children’s books. 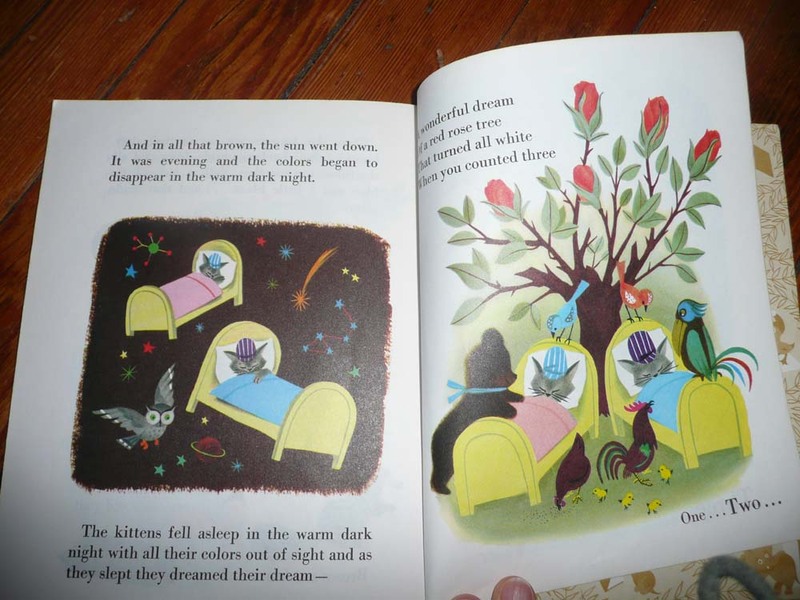 The illustrations in them are fantastic! I know these are antiques because they were even before my time!!!! Next we have a hand painted tray from the 1950’s. 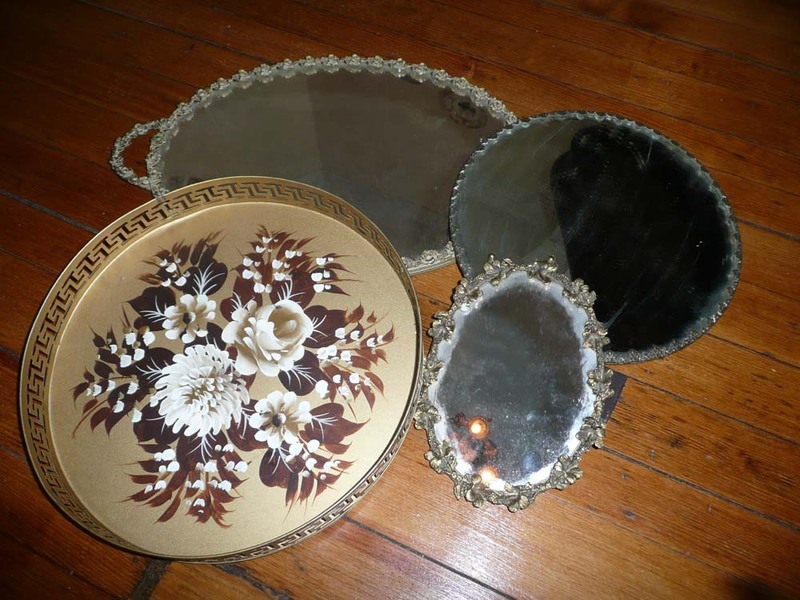 There are also three nice old mirror plateaus with metal roses bordering each. Unfortunately I didn’t clean them before I photographed them, but they really did clean up nicely. 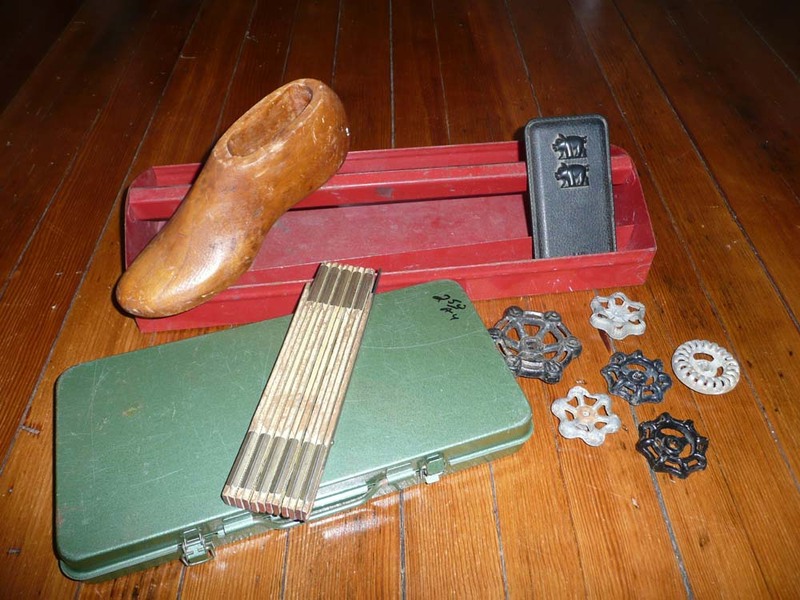 Here is a group of what I consider “mantiques” The shoe form is hollowed out and will make a great business card holder. The green metal tin will get decorated somehow. The black case in the red tool holder is a Milton Bradley game called “Pass the Pig”. It has two little plastic pigs, a score pad and a little pencil in the case. It is from 1974 and there are no instructions. I’ll have to google how to play the game. The faucet handles are pretty cool too. I’ve seen people make statement jewelry out of them. 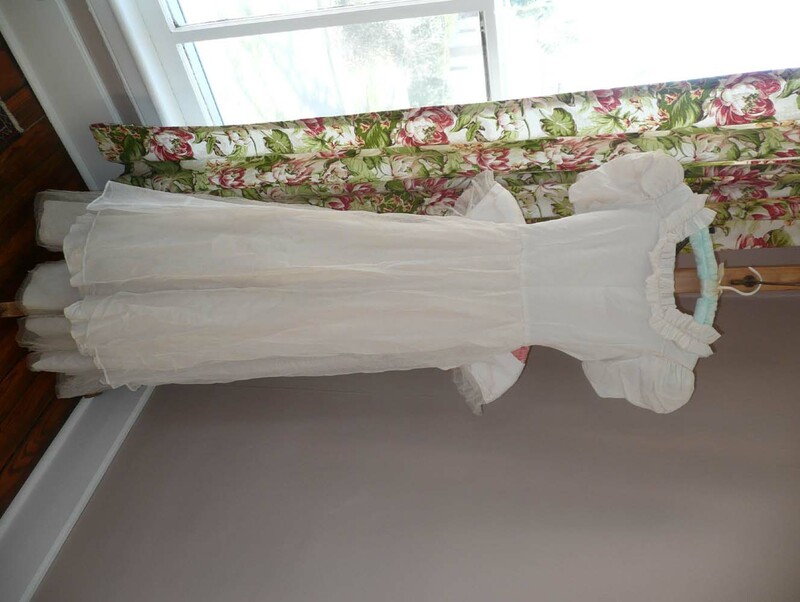 This is actually two white 1950’s dresses with tulle. Obviously the one in the back is hidden. There are a few other things I got but some are already in the laundry and others just didn’t fit into a grouping. All in all I am very satisfied with today’s treasures, both the things I bought and the people I met. God blessed me mightily today! So where did you go to find all this wonderful stuff?